One of the first questions I am always asked when someone finds out I’m vegan is “Don’t you miss ____?” And the short answer is no. This is often a surprising answer because A. “How can you live without cheese? !” and B. I am a born and raised New Yorker living in a multi-cultural foodist’s mecca. Mix 1/2 C flour, water and corn starch in a large bowl to create a batter, then on a separate plate combine the breadcrumbs, herbs and spices. Place the remaining 1/4 C flour into a ziplock bag and set aside. Cut the mozzarella block into 1/2 inch sticks – I very annoyingly ended up with nine, so after it was fried I immediately ate it to make it an even number. Place all mozzarella pieces into the ziplock bag with the flour and give it a good shake to ensure they’re all evenly coated. Shaking off the excess flour, one at a time, dip each piece into the batter and allow the excess to drip off. Toss it in the breadcrumbs, leaving no breadless spots. Repeat step four until each mozzarella stick is breaded, lay them out on a small cookie sheet and place it in the freezer for at least one hour. I would imagine these can be prepped the night before. When it comes time to cook them, if you’re like me and don’t have a deep fryer, heat an inch of neutral oil (I used canola) in a deep pot. To see if it’s hot enough I like to throw in a few bread crumbs to see if they sizzle right away. Once hot, fry mozzarella sticks in batches for 2 minutes on each side until golden brown and a tiny bit of melted cheese peeks out, then place on a paper towel to drain off the excess oil. Keeping the oil hot is what keeps them from falling apart. Serve immediately with hot marinara sauce. The cheese stretches like the real thing, so you’ll want to show it off to everyone. If you’re like me, it serves one, but I guess it could serve two people if you really want it to. If you follow us on Instagram then you know that VGF Megan Stulberg has been designing some vegan-themed goodies. And finally, it’s here! We have just soft launched our Etsy shop. Since we are *just* getting started, everything is in pretty low quality — but let’s stick with marketing it as “limited supply” or ooh! Even better: “limited edition”. More designs will be produced soon as well. “Hey” donut sticker for $3 eachWe’re don’t really expect to turn a profit or anything with these, we just want to promote veganism and also add more cute to the world. Money from sales will simply go back into making more of ’em. We’re still figuring out shipping and pricing so numbers may bop around a bit in our shop — if anything seems off to you, please don’t hesitate to contact us at vegangirlfriend@gmail.com. Vegan Girlfriend’s Tofu Pad Thai! We all live very busy lives (Megan works full-time as a social media specialist, Aine’s a sketch comedian and Alex has her own no-bake dessert company), so it’s a rarity that the 3 of us get to produce content for Vegan Girlfriend as a group. 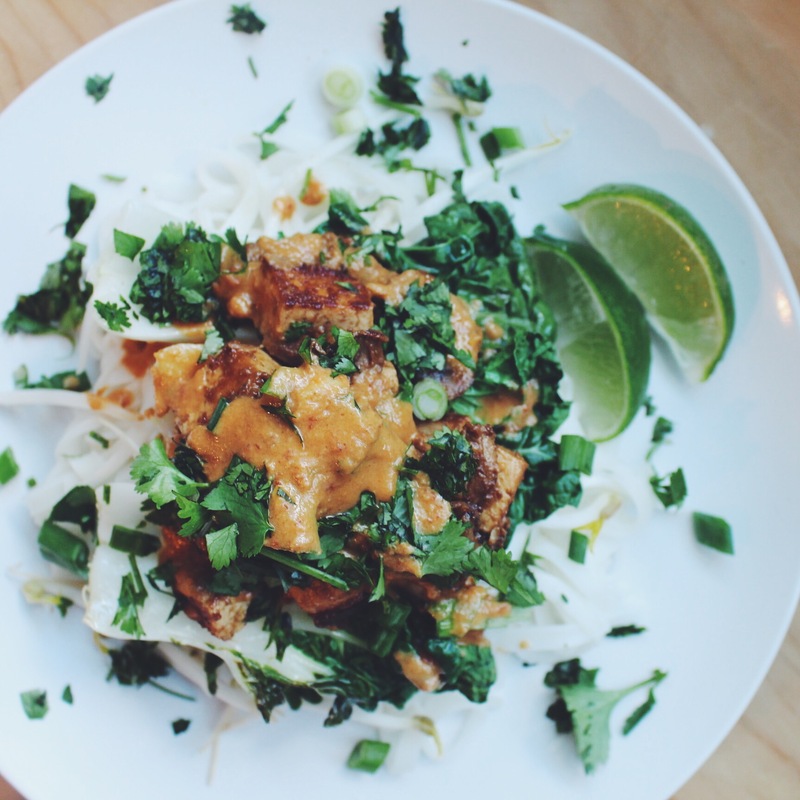 But, lo and behold, we managed to whip up this delicious tofu pad thai together! We even created a video to accompany the recipe, which you can watch here. A huge thank you to our friend Andrew Olivares for filming and editing this video for us! We’ve also *finally* set up a YouTube account, we’ll have toooons more videos coming your way soon, so subscribe to us here. One package of rice noodles, prepared as per package’s directions. Prepare rice noodles by placing on large bowl full of boiling water. In a hot skillet, heat coconut oil. Add garlic. Sautée until garlic is fragrant. Once mushrooms have reduced in size, add in cubed tofu. Squeeze the juice of one lime over mushrooms and tofu. Cook evenly on all sides, flipping throughout. To make the sauce… In a pot, boil one cup of water. When the water reaches a rolling boil, whisk in peanut butter, tamari, sriracha and lime juice. Reduce to medium heat. Once all the ingredients have been combined, pour half of the sauce into skillet with tofu. Sautée the mushrooms and tofu in the sauce until the tofu is slightly crispy. While mushrooms and tofu saute, heat bok choy in separate skillet on medium heat until slightly wilted. 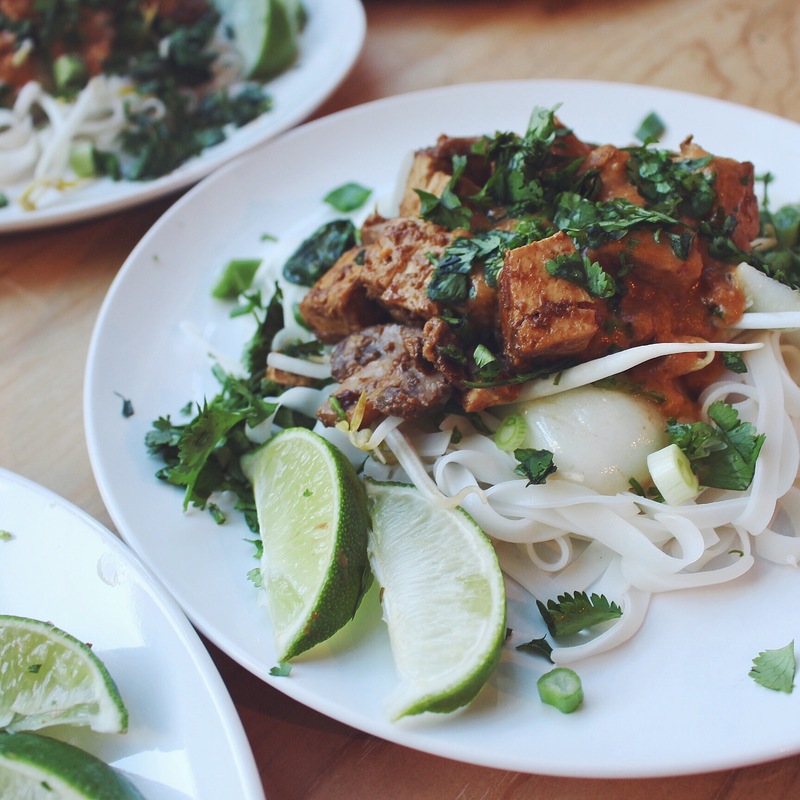 Serve tofu over warm rice noodles. Use ladle to coat with sauce. Top with cilantro, bok choy, green onions, and lime slices. Voila! Makes approximately 4 meal-sized servings.